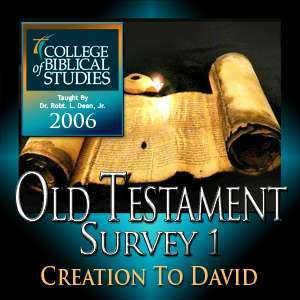 Dr. Dean taught Old Testament Survey I: Creation to David at the College of Biblical Studies in Houston, TX. Lecture 1.1 is from the start of the class until the break for week 1. Lecture 1.2 is from the break to the end of the class for week 1. Lecture 2.1 (Genesis) is from the start of the class until the break for week 2. Due to technical reasons this lesson did not record on September 11, 2006. It is a copy of the lecture from a prior semester. Lecture 2.2 (Genesis) is from the break to the end of the class for week 2. Due to technical reasons this lesson did not record on September 11, 2006. It is a copy of the lecture from a prior semester. Lecture 3.1 (Genesis) Due to technical difficulties the recording from the start of class to the break for week 3 did not record properly, on September 19th, 2006. This recording is from a previously recorded class. Lecture 3.2 (Genesis) is from the break to the end of the class for week 3. Lecture 4.2 (Job) is from the break to the end of the class for week 4. Lecture 5.1 (Exodus - Part 1) is from the start of the class until the break for week 5. Lecture 5.2 (Exodus - Part 2) is from the break to the end of the class for week 5.